April 1 is the start of the new academic and fiscal year, the time when runners move up from high school to university teams and on from university to the corporate leagues. The Kanaguri Memorial Meet is always one of the first chances to see people debut in new uniforms, and even though it was a week later than usual this year there were still lots of interesting items to be had. #1 among them was the debut of Australian Melissa Duncan in the Shiseido team's pink uniform. Duncan had no trouble putting away the field of Japanese and Kenyan corporate leaguers, soloing a 15:20.88 to win the women's 5000 m A-heat by over 20 seconds. 2018 National Sports Festival women's 1500 m champion Ran Urabe (Nike Tokyo TC) had a much narrower margin of victory in the 1500 m A-heat but still pulled out a win over 2018 World U20 Championships 3000 m gold medalist Nozomi Tanaka 4:21.96 to 4:22.25, Tanaka debuting in the new Toyota Jidoshokki TC uniform after moving to that club sponsor at the start of the month alongside training partner Yume Goto. The men's 1500 m was relatively conservative, with Hiroki Matsueda (Fujitsu) taking the win in 3:44.46. His new teammate Yuta Bando, the 2018 National XC Champion, had a breakthrough in the men's 5000 m, beating Kenyans Peter Langat (SGH Group) and Joel Mwaura (Kurosaki Harima) to win the A-heat in 13:32.59. 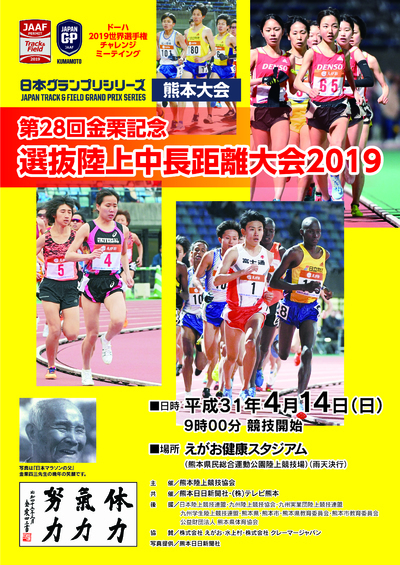 2019 National University Half Marathon champion Akira Aizawa (Toyo Univ.) was 4th in a school record PB of 13:34.94. Toyo grad and half marathon national record holder Yuta Shitara (Honda) was just over a second over his PB in 5th in 13:35.70, his best race since his 2:06:11 at last year's Tokyo Marathon. B-heat winner Bernard Koech (Kyudenko) was slightly faster than Bando at 13:31.69, but the fastest 5000 m of the meet came in the C-heat via another newcomer, Vncent Yegon Kibet (Tokyo Kokusai University) with a 13:30.51 to beat a solid field of Japan-based Kenyans.